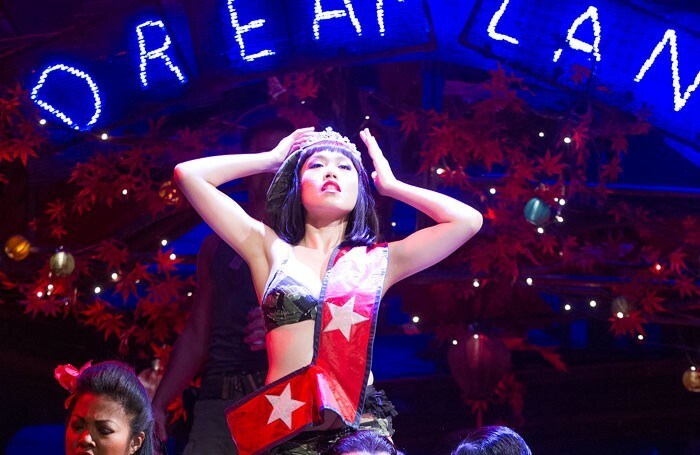 “The heat is on in Saigon,” sings the male chorus in Miss Saigon. And in Kiss Me, Kate the second act begins with the chorus in a sweltering show complaining that “it’s too darn hot”. But West End theatres now have their own version of a lottery ticket that each customer is forced to pay for every time they visit, namely the compulsory restoration charge – but there are still few signs that this is being spent on actual restoration or anything meaningful for customers like the installation of proper air conditioning at many West End theatres. If they operate anything, it’s still often (very) old-fashioned air cooling, which is simply moving air around the auditorium (which is already hot). That’s what they’ve got at the Vaudeville, but I was assured that it was cool before I got to the opening night of The Importance of Being Earnest. I was even invited to step into the auditorium before the audience was admitted to verify this was the case with the theatre’s operations director. And it’s true: it was. He also told me that they kept the iron (safety curtain) down to keep the auditorium cooler before the show started, and kept the house lights off. Trouble was, once an audience came in and the show started – and with it, the onstage lights – the auditorium started heating up. I suppose it’s difficult to strike a happy balance – some theatres with full air-conditioning, like the Victoria Palace, can sometimes feel positively chilly. At Broadway houses, where every theatre has air-conditioning, you should take a cardigan if you go in the summer, as it’s often turned up so high. It’s impossible to find out exactly what provision each theatre has online. The Society of London Theatre site, Ambassador Theatre Group, Delfont Mackintosh and Really Useful Group don’t have the information anywhere obvious. But even if they do, it’s sometimes ambiguous – exactly what is meant, for instance, by Nimax’s “Comfort Cooling system”? On the other hand, the resourceful marketing types at TKTS have cooked up a weather-related promotion to provide customers with free ice creams if they use the right credit card and get in early. So maybe there’s an upside to the heatwave after all.